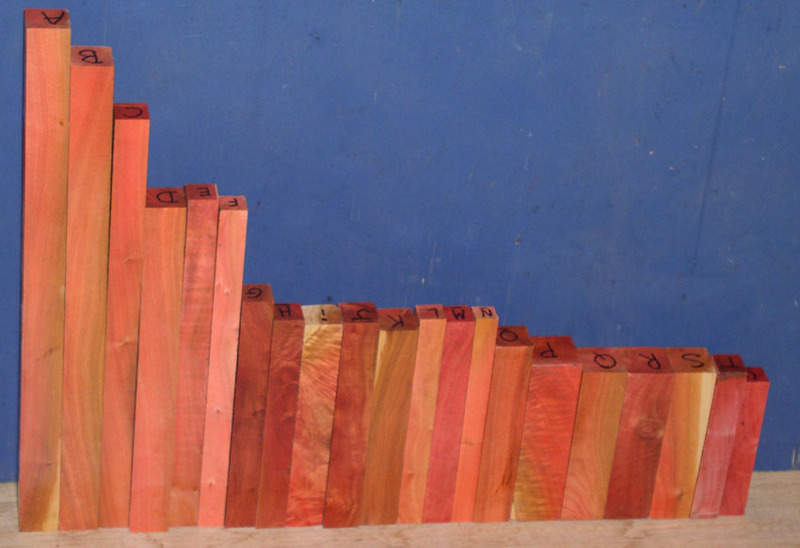 Pink Ivory wood, a sacred wood of Zulu chiefs in Southern Africa, has long been treasured as a rare wood. At one time, it was said to be rarer than diamonds. The wood grows in various parts of Africa, and takes hundreds of years to reach a size suitable to make a bowl blank. It has a very fine grain and takes as high a polish as you would like to give it. 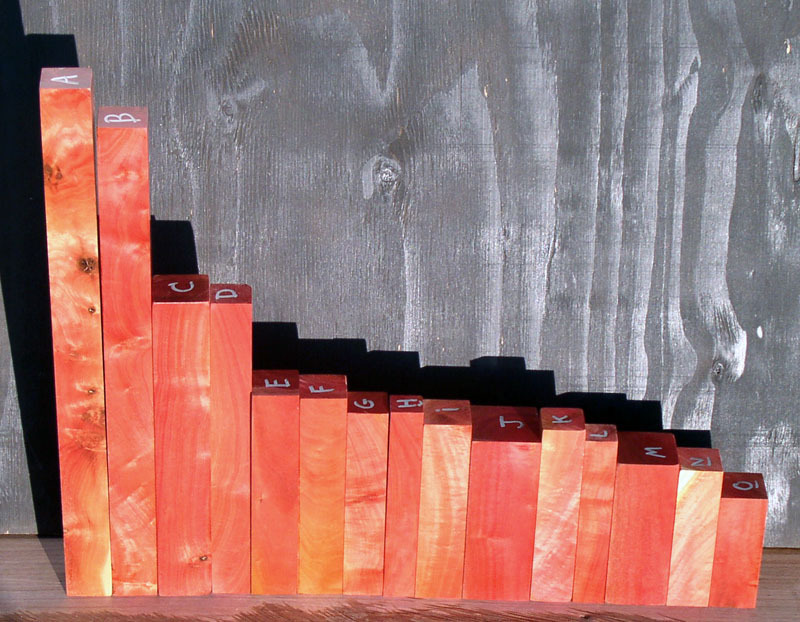 Finishes that block UV light can be advantageous, since sunlight will gradually darken the wood. A fantastic ornamental turning wood also. Very hard and heavy, with the ability to take very fine details. Most of our Pink Ivory is dried (will be marked on the item if dried, except pen blanks which are always dried). This is no simple process. The logs are allowed to dry for 5-10 years and they crack profusely during the process. 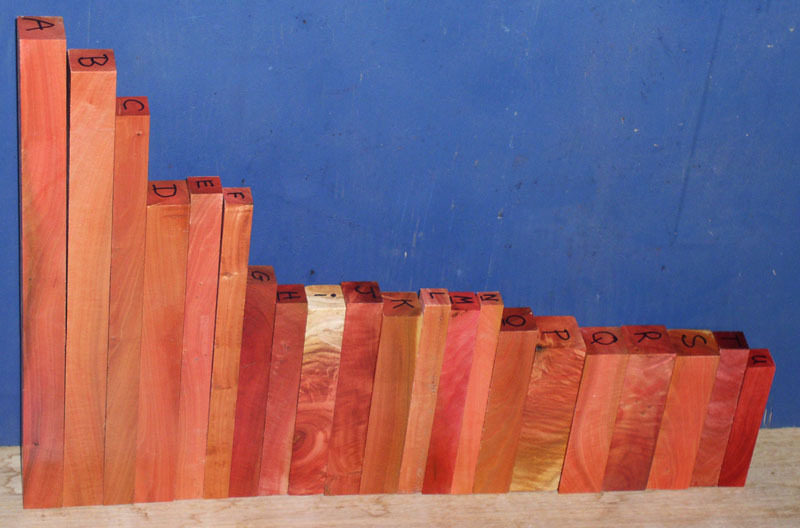 We then get an average yield of 18% from each log that is free of defects and has good color (good color is less then half the usable wood) to make the pieces we sell, and mostly we get pen blanks. 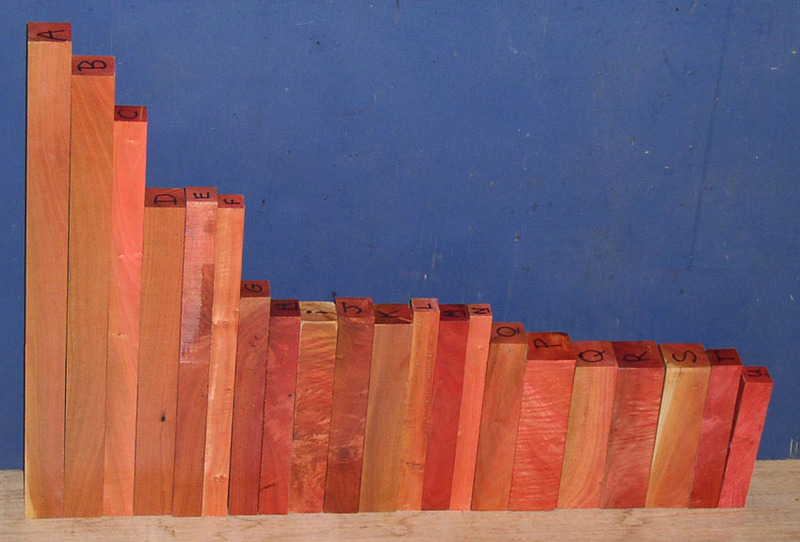 Many logs can't produce a single 1.5 x 1.5 x 6, and larger is truly rare. 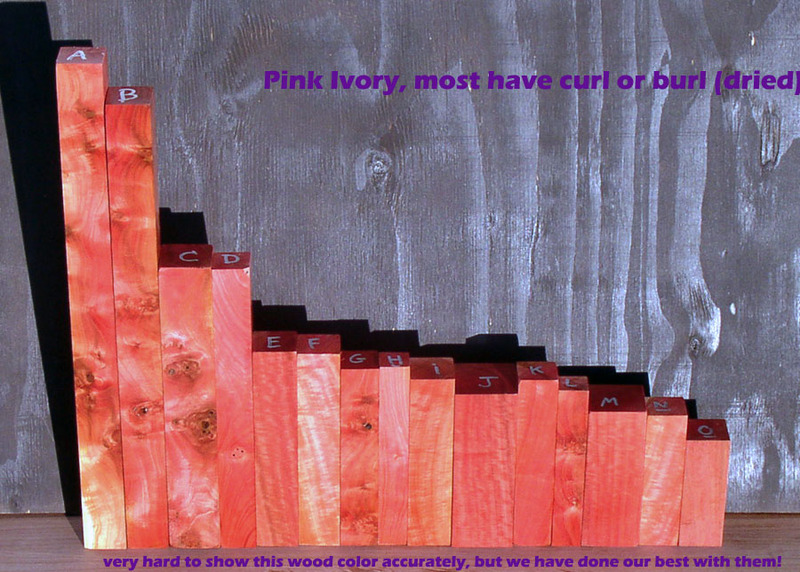 Selling wet pink ivory is very different and has far lower costs. To dry a piece that is 2 x 2 x 12 from the wet/waxed state will take at least 3 years (usually 4) of constant humidity above a certain level and a fairly constant temperature using the right techniques. It takes years of monitoring and occasional adjustments to dry a piece of wet pink ivory if you can provide the right conditions. For that reason, the pieces not marked dried are far cheaper since there is about 75% less labor to produce them. Truly dry Pink Ivory is so much trouble to produce that it is rare on the market in these defect free pieces we make. 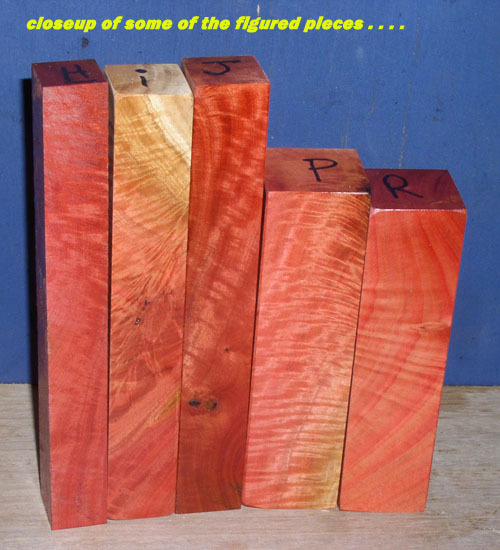 Be aware of some vendors false claims of dry wood, it seems to be a very common claim for many woods we have tested to be completely wet after we buy a piece to verify claims of dryness. 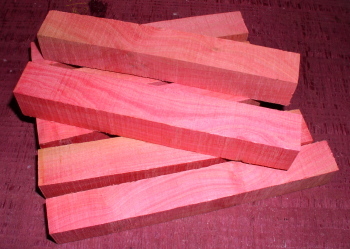 Primo: best pink to red color over 95% before turning. 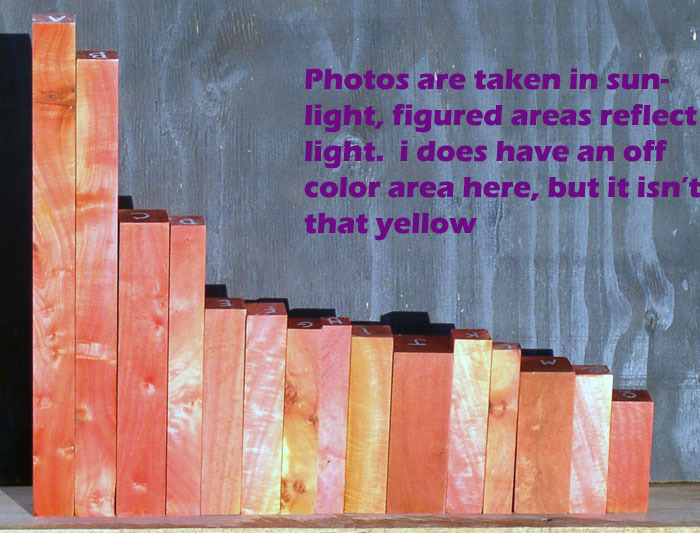 No more than one tight knot under 1/8" that is light in color, usually knot free (burl eyes are not knots). Excellent quality: has good color over part of the piece after turning round, might have a tiny (max of 3/16" )knot or two that is black and some off color wood . Good quality: Has off color wood even after turning, some pink to red though and is still a good piece. Small tight black knots up to 1/4" allowed. 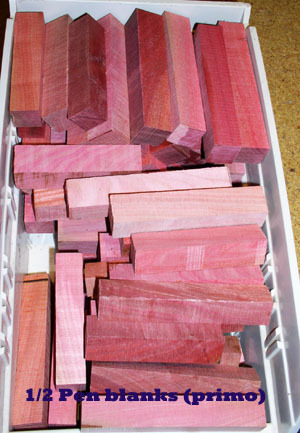 Seconds: Have some (50-100%) off colors and may be as short as 4.75 " if a pen blank. Figured: has some curl figure as well as at least excellent grade. Sample photo of primo color. NOTE that pieces marked air dried have been through many years of drying and are ready for use. These are about 10 times as hard to get as waxed undried/"green" pieces. 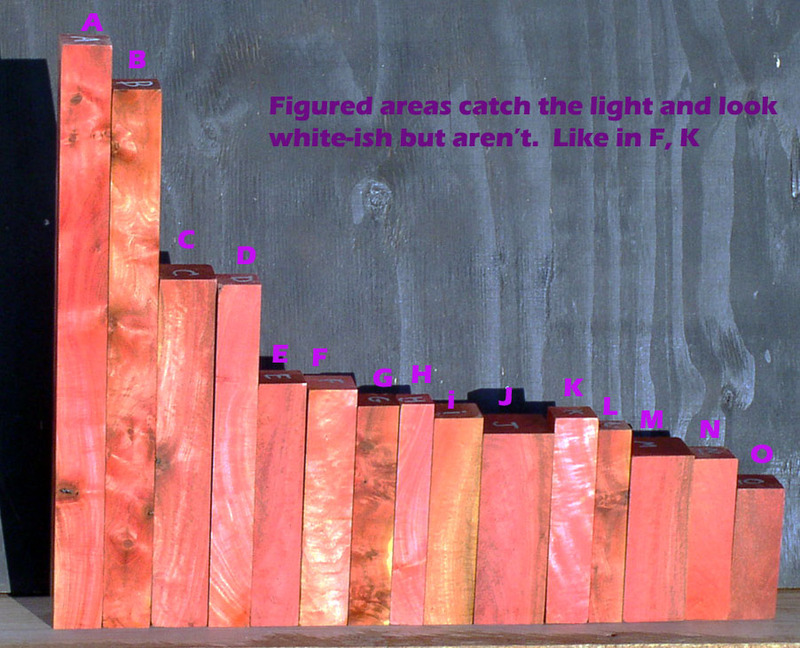 This is why it is so hard to get dry wood: We let the wood dry first for over 5 years, it cracks a lot (only a 20% yield after drying---which means our material cost is five times higher than wet wood), then we cut out the perfect pieces for you. Usually, the waxed pieces most vendors sell are cut from green wood which has not yet cracked during the drying process. These dried pieces are rarely found on the market. Pieces are dry only if marked on the item as kiln or air dried (on our website air dried means really dried, 12% or below). 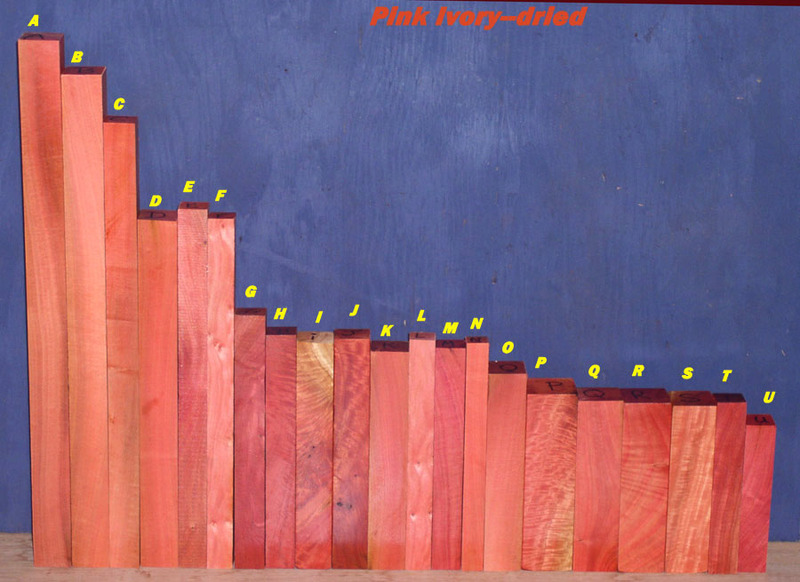 Most vendors use the term "air dried" for wet wood--we don't! Pink ivory 1 x 1 x 6 inches, with Excellent grade color! Pink ivory 1 x 1 x 6 inches, with Primo grade color! Dried pink ivory, some with burl and many with figure. Cut in our own shop (the only way to assure quality with this wood type). Not easy to show these colors correctly as pink ivory can fool digital cameras, so we did our best to show the way it looks to the eye. Click here for final fourth side view. This group sold, working on more soon. Nice pieces in completely dry pink ivory we have gathered together over the years. Many of them have some figure, a few are high figured. There is a closeup of some of the most figured ones, be sure to check that out. The following pieces have some level of figure: F, H, i, J, K, L, M, O, P, Q, R, S, T, U .
Click here for a closeup of some figured pieces.